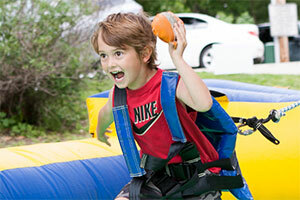 The Family Fun Festival at Elkhorn Days is an afternoon filled with games, activities, rides, inflatables, prizes and more. The best part is that all these activities are completely FREE. Just look for the more than 50 “Play for Free” signs around Ta-ha-zouka Park and instantly join in the fun! View a photo album from last year! The activities are free, but we do recommend bringing some cash if you’d like to enjoy some of the delicious food and drinks that local vendors will provide in the park. To learn more about all the events happening over the Elkhorn Days weekend, visit elkhorndays.com. Why does Relevant take part in this? We care about our community, and wanted to provide a fun way for families to enjoy a summer Saturday afternoon together, without emptying their pockets. So we’ve covered the cost of numerous games, rides, and activities. We truly hope this is a blessing to our community, and gives families a memorable day. Learn more about fun events we put on in our community!